IMCapture for FaceTime presents a feature-rich recording tool that focuses on the excellent output quality and reliable converter. Advanced audio and video settings allow to adapt codec and bitrate resolution. Minimalistic and friendly interface facilitates the recording process in a real time displaying all necessary buttons in the main window. This powerful call recorder is irreplaceable both in daily life and business environment. 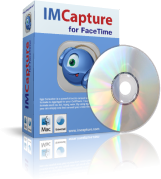 IMCapture for FaceTime is designed to record your talks, smiles, and laughs during calls to Mac or iPhone 4 right from your Mac. This is undoubly a breakthrough software that combines powerful call recorder and worry-free conversion. This universal call recording software becomes a truly irreplaceable software both in everyday life and at work. Qweas is providing links to IMCapture for FaceTime Mac 1.4 as a courtesy, and makes no representations regarding IMCapture for FaceTime Mac or any other applications or any information related thereto. Any questions, complaints or claims regarding this application IMCapture for FaceTime Mac 1.4 must be directed to the appropriate software vendor. You may click the publisher link of IMCapture for FaceTime Mac on the top of this page to get more details about the vendor.